I BOUGHT YOU A BANK! Bank of America Corporation is one of the world's largest financial institutions. Bank of America provides banking and non-banking financial services and products to individual consumers, small and middle-market businesses, large corporations, and governments in the United States and internationally. 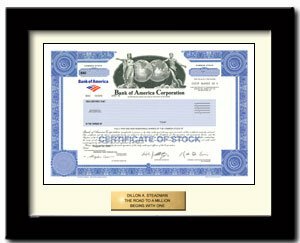 As of Aug 2013, Bank of America stopped issuing paper stock certificates and registers ownership electronically instead. The recipient still becomes a real shareholder of Bank of America with all associated rights.